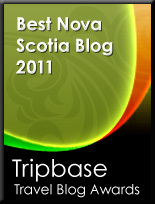 A few weeks ago, I wrote a post on innovative brunches in Halifax. I love The Coastal Cafe for their yummy eggy, bacony, etc. creations, but another resto who offers crazy-good brunch dishes is a little closer to home - Fid Resto. This is another multiple meal post, but all of the photos and dishes featured are brunch items available on the Fid Resto menu, and ALL are delicious! For those looking for a meal a little on the lighter side, you should try The Good Bowl on for size. A bowlful of filling, healthy, fresh ingredients culminate into a meal full of flavour! If decadent but fresh comfort food is what you're after, this daily special would be just the thing. I know, fresh and decadent in the same sentence? Allow me to elaborate! Fresh, verdant basil pesto, combined with cream created this lovely, lush sauce that blanketed the soft and tender gnocchi. The Lamb Breakfast at Fid are what a protein addict's dreams are made of! The sweet and savoury lamb meat is wrapped around lamb sausages filled that include dried fruit and nuts. Two fried eggs pair beautifully with the sweet tomato jam and yummy potatoes...there was something amazing about the potatoes as well, but I can't quite remember that detail! I don't think this is on the regular menu, but it reminds me of something my grandmother would have made - just simple, good quality ingredients. This dessert seemed like the kind of snack I'd like to have right before bed - talk about sweet dreams! My three dining companions decided on the full breakfast. This plate is a ton of food and totally worth the price. The fact that you get a little bit of everything with this dish really evokes the 'full' in Full Breakfast. Ahhhh - this was so good!! A perfectly cooked, hard-boiled egg was enveloped in a sweet and savoury ground meat mixture, then coated with a crispy batter. You could hear the crunch as I cut through. I'd love to say that I made a dent in this, but alas, my little belly could only hold half this and some crumpet...I ended up letting my 22 year-old, rugby playing cousin have it....after he had devoured his own Full Breakfast! Where do men put this stuff? My first Wine Dinner gig!